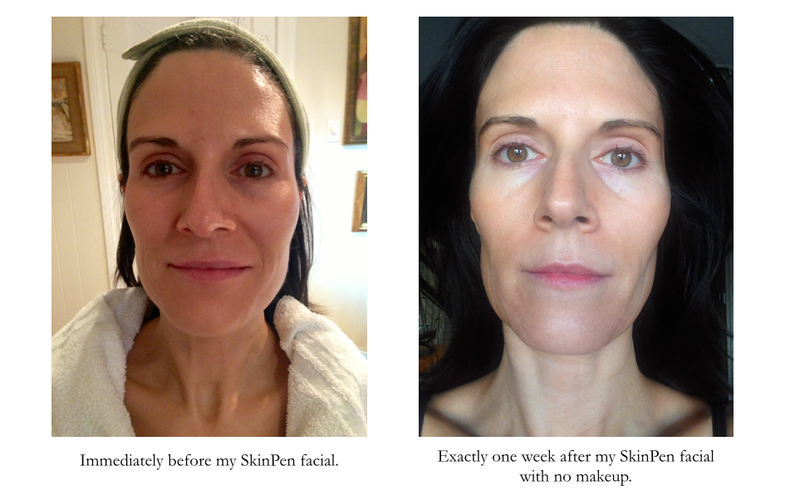 SkinPen Review: Dynamic Results With Little Downtime | Gina Miller's Blog - A working mom's blog about fitness, travel, handbags & beauty. I scheduled an appointment at Luxury on Lovers for Wednesday, January 14th. I had a photo shoot on Monday, January 19th, so I wanted my skin to glow but also needed it to look camera-ready. Meaning: no redness, sloughing or peeling. Cobb guaranteed I would be good to go. The procedure begins with an application of numbing cream. This helps dull the pain of the SkinPen needles hitting your skin. Luxury on Lovers aesthetician Monica Klocksieben then applied a serum on my skin to begin the SkinPen facial. She glided the SkinPen all over my face, focusing on areas that needed a little more help. While the procedure isn't necessarily a relaxing facial, it never hurt. I have had plenty of photofacials (with which I have a love/hate relationship: love the results, hate the procedure) and this wasn't anywhere near the pain or discomfort level of a photofacial. I would say the SkinPen "smarted" and stung a tiny bit. The procedure lasted about 60 minutes, longer than a typical session because I was taking photos the entire time. Immediately after the procedure, my face was red. Thankfully, I wasn't going anywhere that afternoon. That night, my face felt tight and a bit warm, like a mild sunburn. Cobb gave me a hyaluronic acid serum to apply liberally. I followed her instructions to a T and slathered my face with it. Luxury on Lovers provided a detailed after-care instruction sheet advising me to avoid retinol and exfoliators for a few days. My face was a bit pink on Thursday but with some makeup it wasn't noticeable at all. I applied Elta MD UV Tinted Daily (LOVE this stuff - read my Elta MD review HERE), some powder, blush and went about my day: lunch at Hillstone with a friend, followed by a party that night. You can see a bit of redness on my forehead in the above picture. Friday my face starting sloughing, especially in that "goatee area" around my mouth. Saturday I had some sloughing on my cheek. This is all completely normal. Monday, the day of my photo shoot - no sloughing! By Sunday, most of the dead skin had pretty much sloughed off. I had some rough patches that I smoothed out with my Clarisonic. My concern was making sure my skin was completely smooth for the photo shoot on Monday. Turns out, it was. Here are the results one week later. I am thrilled. My skin is soft and the complexion is even. I have been told by other SkinPen "veterans" that the results continue to improve over time. Cobb says the results are most visible about 3-4 weeks out. Happy Dance! I loved it. This was a painless procedure that addressed some of my skincare concerns and required virtually zero downtime. When I have had photofacials in the past, I have had to ask the camera operators at my old TV station to stay on a wide shot and not zoom in because my face was peeling sheets of skin. While there is some sloughing, it's not nearly as significant as the photofacial. Click HERE to learn more about the Dermaplaning Facial I recently had. The SkinPen treatment is ideal for people who want to treat acne scars, deep wrinkles or sun damage. It can be done on any type of skin, including ethnic skin which is limited when it comes to laser and intense light therapies, according to Cobb. *The SkinPen facial was provided by Luxury on Lovers for review purposes. All opinions expressed here are mine. For more information on Luxury on Lovers, click HERE.